2 sugar pumpkins were heavily roasted yielding about 3 pounds of sweet pumpkin meat that was pulverized and added to the mash. Update: You can find a full review of this beer, here. People seem to either love pumpkin beers, or love to hate them. Craft beer drinkers consume them in quantity each fall while a certain segment of ‘beer geeks’ gleefully rant about their disdain for the style and write them off as a trend (oh, the irony). Having been part of this latter group, I can confidently say that my tune has changed. In particular, I look forward to the yearly ritual of consuming high gravity samples like Elysian’s ‘Great Pumpkin’ and the signal of fall these beers represent. Many craft pumpkin beers feature in-your-face spicing paired with a big residual sweetness. For this beer, I am shooting for something a bit different. While malt-forward, the focus is on toasty bready notes, and less on sweet caramel. This beer features low-spicing — hopefully allowing the heavily roasted pumpkin to shine through. The goal of combining a Maris Otter base with biscuit and honey malts was to produce a graham cracker like character, similar to what is found in pie crust. Recirculating for mashout. 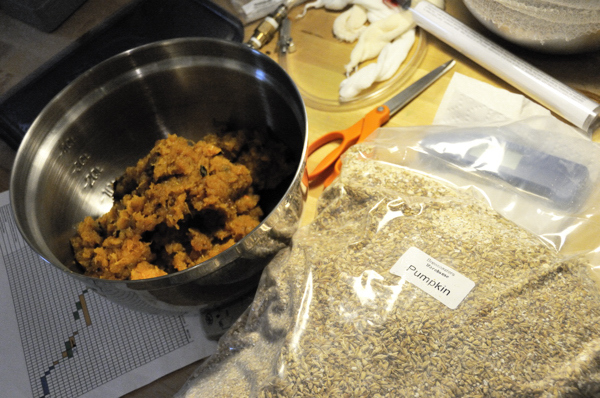 The malt bill and pumpkin produced a very nice orange color. 1. Chill to 60* F and keep at 62* F until activity slows (1 week+). 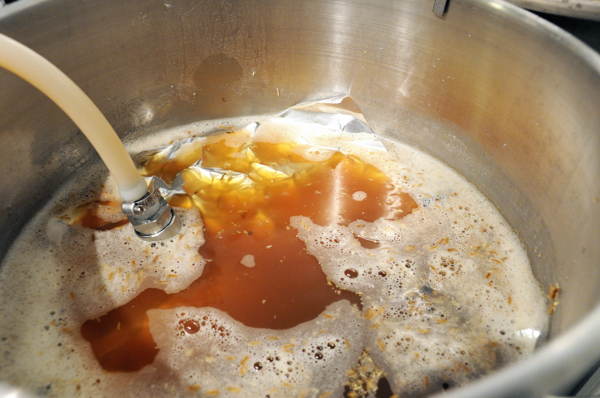 This entry was posted in Homebrew Recipes, Homebrewing and tagged ale, american beer, barley wine, homebrew, homebrewing, pumpkin beer, recipe, specialty beer by Nick Ladd. Bookmark the permalink.